Our Rusty Brown partnership is thriving and the 3 of us have never been more engaged in our work. We have been doing a range work together and, at time, individually. The work that really excites us are the multi-stakeholder journeys that go beyond the usual, one-off workshop. These groups contain a diverse mix of people and groups who have ‘skin-in-the-game’, in relation to some complex, intractable challenge(s) that they face together. These groups (representing a slice of a system or field) are often stuck and know that a collective effort is needed to make progress. 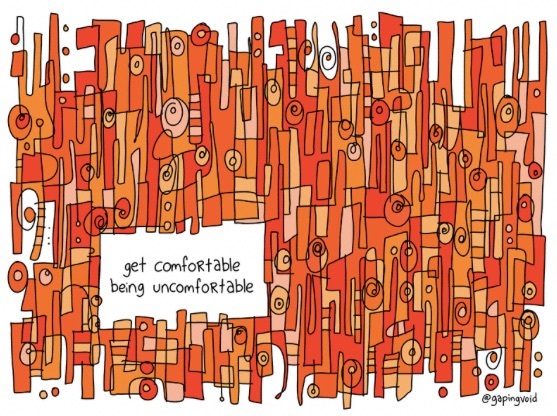 Along these learning journeys, part of the task is to build stronger relationships and develop the courage to be creative, take risks, let-go of safety and be willing to “get comfortable being uncomfortable”. This entry was posted in Collaboration, On Transforming Things on August 5, 2015 by Geoff Brown. I spent most of last night … until 1am in fact … devouring some new and old readings on applied improvisation. I purchased Robert Poynton’s new Do Lectures book – Improvise and dusted off a whole bunch of Group Work activities that joyfully immerse people in purposeful play. I feel like I have re discovered an old friend. I know that my application of activities from the Applied Improv world have, at times, missed the mark. But mostly, they have connected and supported groups to discover new ways of working, leading, collaborating and simply being with each other. Note to self … time to re discover my love and application for Improvisation! This entry was posted in Applied Improv on June 11, 2014 by Geoff Brown. About 3 years ago I received a beautiful gift from Gary Hirsch of On Your Feet. It was (and still is) a Bot … a hand painted monster on the back of a domino. Gary creates thousands of these things and his obsession for sharing (and letting go) of his BotJoy art has gone places. Back in 2010, I had a the pleasure of spending 3 days with Gary and a couple of hundred other improvisors in Portland, Oregon at the Applied Improvisation Network (AIN) annual conference. Viv McWaters introduced me to joy of Improvisation some years before and it was at Portland that my love for all things Improvisation was born. 4 years on, I stumble upon a Tedx-Portland talk by Gary Hirsch on the topic of collaboration. Given I know Gary and I have a Bot I had to watch him teach and perform. Enjoy! This entry was posted in Applied Improv, Collaboration on June 10, 2014 by Geoff Brown. Co-conspirator of mine, Chris Corrigan, has shared a post he titled – Dealing with your slaves and seeing the world. This piece is a timely reminder about how we perceive the world around us. For me, it’s a little challenge to my own perspective … and to the stories I make in my mind about any problem that I am tackling. Imagine if we could really see our own part in every complex problem we perceived – local or global. I think this self perception would fundamentally change a lot of conversations. A deeper understanding about our part (and the parts other’s play) in the problem helps to build up a better picture of the whole. You can apply this to different scales – individual, team and organisational, national. What is my part (and how am I complicit) in the device-addiction that has crept back into our family life since returning from our 5 month trip last year? And then … how can I affect change from within the problem? This entry was posted in On Transforming Things on January 28, 2014 by Geoff Brown. Are we throwing birds … or stones? If we embrace the idea that an organisation is a living ecosystem, rather than a mechanistic model, how would we work with that larger consciousness? Paul Plsek likens this difference to that between throwing a stone and throwing a live bird (1). The trajectory of the stone can be calculated precisely using the mechanical laws of physics. The trajectory of the bird is emergent and far less predictable! The question is whether we can genuinely embrace this shift in perspective and add a layer of living tissue to the organisational machine. The good news is that we don’t need to abandon everything we currently do. When dealing with technical problems, we still need efficient management, expertise and best practice processes. But on their own, rational, linear and individually-generated solutions are not up to the task. It’s not enough to just bring our brains to work. We need to access and apply our whole intelligence to problem-solving, creativity and innovation, especially in the complexity of global, local social and environmental issues. Applied Improvisation is at the heart of our offering at Rusty Brown and we know that improvisation is a key driver for business and organisational success during times of uncertainty and change. Ironically, we all know how to improvise, but most of us spend too much time planning and never get to the improvisation part. And when you look at the cutting edge of business today, the most pioneering and successful companies are moving in exactly that direction. Their leaders know that innovation comes from a careful balance of planning and improvisation. By applying improv, their people are cultivating strong relationships and are being creative with limited resources. These organisations are deeply fulfilling to work with, enrich the communities they serve and are able to thrive in uncertainty. Since being introduced to Applied Improv 7 years ago, it’s principles have reshaped the way I facilitate, consult, parent and live life. In practice, applying improv has connected me to a deeper self, an authentic part of me that I never knew existed. This entry was posted in Applied Improv, Complexity on December 8, 2013 by Geoff Brown.